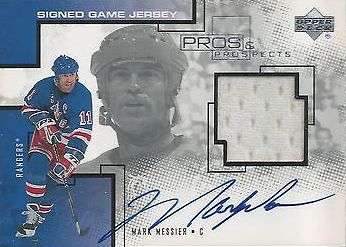 Mark Messier had his number retired on January 12, 2004 and the Garden was rocking. Messier did not spend the majority of his playing career with the Rangers, but his contribution to the team more than makes up for that. After 12 seasons and winning 5 Stanley Cups with The Edmonton Oilers, Messier made it clear he was unhappy with his team. Among other things Messier was upset the Oilers were unwilling to renew his deal with them early and that they let Adam Graves go to New York. With two seasons left on his contract, Messier was traded to the Rangers, a move that left him elated but many fans in his hometown of Edmonton unhappy. Messier was not the magic bullet Rangers fans were looking for in his first two seasons but that all changed in the 1993-94 season. Down 3-2 in the Eastern Conference finals, Messier did what other New York Legends like Joe Namath had done before him, he publicly guaranteed a victory to avoid elimination. He went on to score a hat trick and the Rangers eventually went on to the Stanley Cup finals. In a tense game at Madison Square Garden, he scored the winning goal, bringing the Rangers their first Stanley Cup victory in 54 year and cementing his place in New York Rangers franchise history. That win made Messier the only professional athlete to ever captain two separate championship teams. Other career achievements include being second on the all-time points list, just behind Wayne Gretzky and second all-time in games played just behind Gordie Howe. He hoisted the Stanley Cup six times and was named to the NHL All-Star Game 15 times. 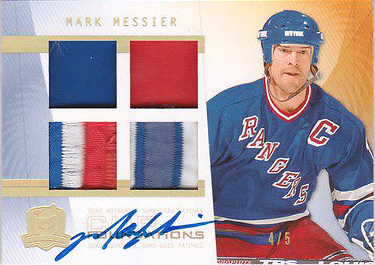 Messier was inducted in to the Hockey Hall of Fame in 2007 in his first year of eligibility. 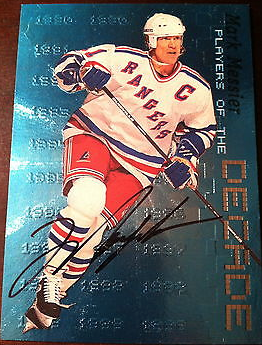 When it comes to Messier’s certified on-card autos he is a prolific signer with over 400 different cards. He is well represented in all of his team uniforms, the Oilers, the Rangers and the Canucks. 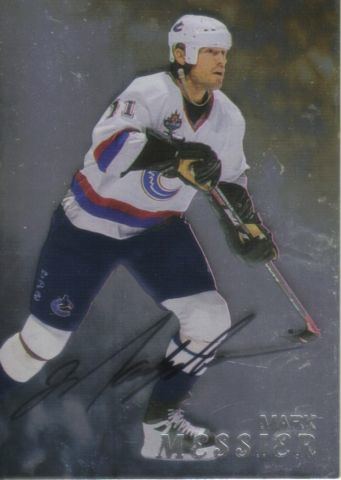 His earlier on-card autos come from the 1998-99 Be A Player line. Soon after that Upper Deck starting offering on-card auto relics like this 2000-01 Pros & Prospects card. 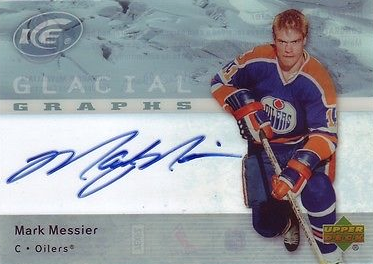 Not long after that Messier retired and cards with photos of him with his original team, the Edmonton Oilers appeared like this 2007-08 Upper Deck Ice Glacial Graphs. For some time he signed heavily for Upper Deck’s The Cup releases, like this 2009-10 Cup Foundations auto relic. Then Panini came into the picture and he was all over the place, most recently in 2013-14 Prime. With so much to choose from, it came down to a few factors for me. 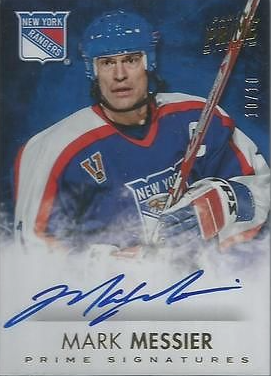 First, I was going with a New York Rangers card, that was easy. Next, I wanted a cards that allowed for a bold signature. That pretty much ruled out auto relics as his signature is big enough to feel squeezed in when swatches take up a majority of the room. Third, if it had something to do with his number, or have his number clearly displayed, that would be a bonus. 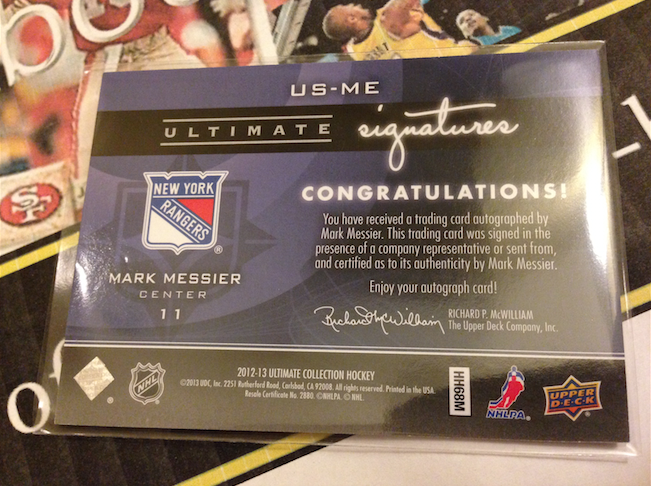 I found all that and more with the card I chose, a 2012-13 Upper Deck Ultimate Collection Ultimate Signatures card. Some may not like the large area of white but I like the way Messier used the real estate. The bold “M” to begin with and plenty of room to finish out the autograph appeal to my eye. Clearly in his Rangers uniform with his retired number 11 showing on his sleeve and the captain’s “C’ is an added bonus. Yes, its the alternative sweater but everything else makes up for that. The back of the card doesn't have much going on, but that’s not a requirement in my book. The Ranger’s shield and Messier’s number help though. Next time I’ll cover the Ranger who was part of Messier’s push to get to New York, Adam Graves.